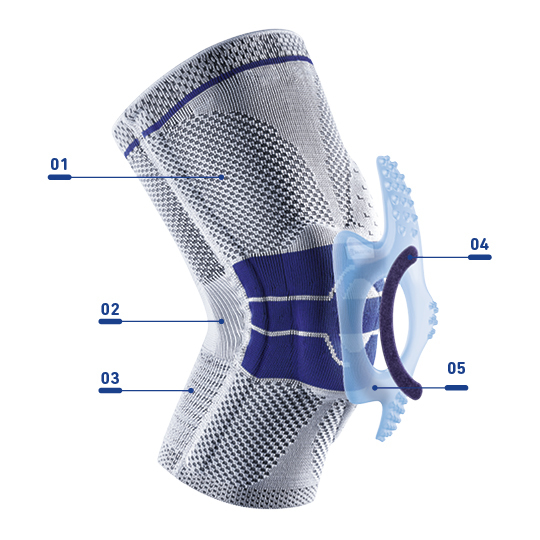 Having won the IF award for both Material and Product design in 2007, the Bauerfeind GenuTrain A3 knee sleeve is a German Made, high quality, innovative, graduated compression support. Working to relieve conditions such as gonarthrosis, ligamentosis, tendomyopathy, knee pain due to muscular imbalance, patella lateralization and varus osteoarthritis, this brace demonstrates versatility and creativity. The soft knit fabric provides comfort and medically effective compression. Viscoelastic inserts encompass all typical pain areas of the knee and has friction zones, which are covered with nubs to stimulate skin receptors and nerve endings. It also features a patella correcting guide which counteracts patellar drifting. 1. Soft knit fabric - Keeps moisture away from the body and machine-washable on the gentle cycle (which helps maintain its elasticity and original fit so it's easy to care for. 3. Expansion zone - In the calf area, makes the support easier to put on. 4. Corrective guide - Keeps the knee cap stable and centered for stability without loss of mobility. 5. Massage pads - Comforting soft stimulating nubs provide pain relief.